Why: Make it easy to buy and sell used astronomy gear and socialize. And for a fundraiser for the SJAA. 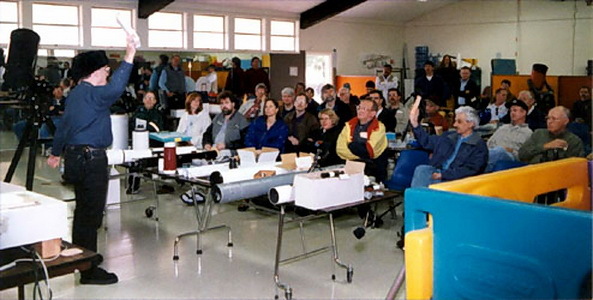 San Jose Astronomical Association hosts its thirty-fifth Annual Spring Auction at Houge Park on Sunday, 8 March 2015. Experienced observers often find equipment they need for their next observing project, from O-III filters to finders to star charts. All kinds of interesting items are found in the auction so don’t miss out on this event! Both buyers and sellers can pre-register here. Sellers can also pre-register their items for sale. Note there will be at least one break in the bidding, but cashing out will not be available until the end (in other words, plan to stay until the end!). – For sellers, you can have a reserve price, but consider an opening bid amount, otherwise, opening bid will be at the discretion of the auctioneer. – Please be aware that this is a fundraising event for the SJAA. Suggested donation is 10% of selling price paid by the seller. More information is always made available on this webpage as well as on the SJAA-Announce List. Please bookmark or subscribe to them to stay up to the minute on the latest developments.